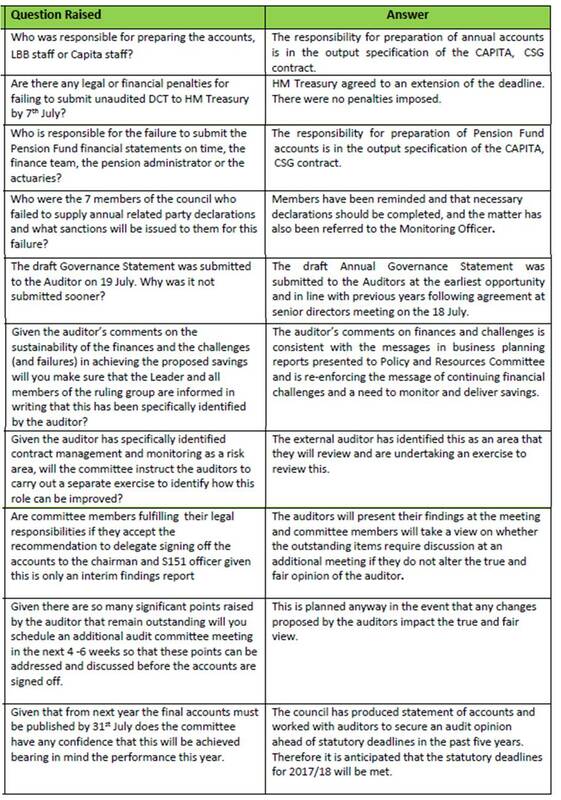 These were just a few of the problems discussed at last night's Audit Committee exposing Capita's shortcomings as the outsourced finance department of Barnet Council. It started last week when the papers for the audit committee were published minus the critical External Auditor's report. It is pretty hard for an audit committee to sign off the annual accounts if they don't have the external auditor's report to review. The deadline for public questions was 10am on Monday morning but there was still no external auditors report. Eventually at 5.30pm on Tuesday I was told the report had now been published. The significance of this is however much greater as not only was this the first opportunity for the public to review the report but it was also the first opportunity for Committee Members to read it. The report can be read here and my questions and the responses can be read at the bottom of the page. Cllr Hugh Rayner is the new Chairman of the Audit Committee and this was definitely a difficult first meeting. He introduced the meeting and allowed me to ask my supplementary questions. They simply highlighted the very real shortcomings of Capita in the audit process. 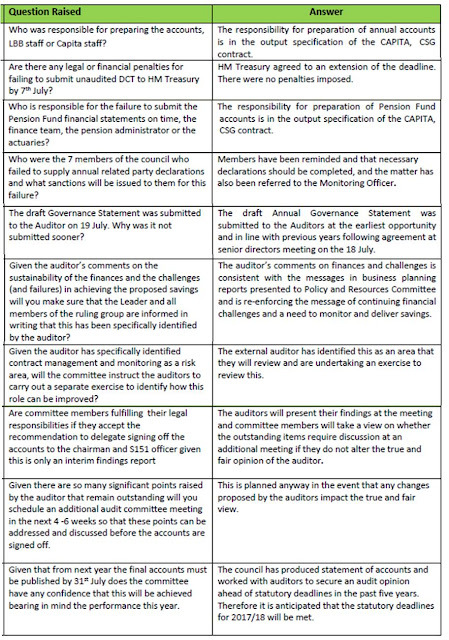 Most of the points in my supplementary questions are then covered within the rest of this blog but one point glossed over in the meeting relates to the failure of a number of council members to submit related party disclosures. This is a key part of the audit process and the auditor remarked that it was poor compared to other councils. In my supplementary question I asked why they wouldn't name and shame these seven councillors. They replied that the number had now fallen to five (although the auditor said he was still awaiting seven disclosures). Given that members knew this was being raised tonight and still hadn't bother to submit their disclosures suggests a level of complacency that is insulting to ordinary residents. Cllr Rayner then changed the order of agenda to bring Auditors report up next. He started by expressing his and the committees dissatisfaction with the audit process and fact that members had only 24 hours to read the report. He noted that the report had so many "ifs and buts" that it was difficult to make a value judgement and finally he noted the failure to mention the Children's OFSTED report which is of major importance as part of the audit process. The external auditor then got their chance to speak, expressing their concern at being unable to provide a final report. A couple of reasonable questions from Cllr Hutton and Cllr Finn and then Cllr Zinkin weighed in. He was concerned about the process - yes we all agree with that - and called the report from the auditors a "complete shambles". Whoa hang on a minute. The incompleteness of the report seemed entirely down to the errors and omissions made by Capita yet no criticism of them? Cllr Zinkin then made reference to the lack of any mention of the OFSTED report on Children's services. The response from the Auditor was that officers had not brought it to their attention that the report had been received and that they had only discovered the report yesterday on the OFSTED website. Such a poor OFSTED report will now mean that the auditor is obliged to qualify the audit report on the use of resources, something that as far as I am aware has not happened previously. Cllr Zinkin followed up with a damning statement saying that if the auditor wasn't aware of the OFSTED report what other things are they not aware of. The auditors' defence was that the accounts were in such a mess that they had to throw more resources at sorting them out first. From my perspective Cllr Zinkin needs to stop attacking the auditor and throw some of his outrage in the direction of Capita whose errors, omission and failures precipitated the situation. At this point Cllr Finn weighed in and, no doubt using his experience as an accountant, steered Cllr Zinkin away from scapegoating the auditor. Yes they should have let the chair of the audit committee know what a mess the accounts were in but they shouldn't be held responsible for the mess. He recommended "giving Capita a kick" as they are paid lots of money and haven't performed. Cllr Khatri then hit the nail on the head by highlighting that there are different organisations involved here, the council, Capita, (plus all the other outsourced services such as Re, Cambridge education, NSL etc) and the auditors. All along I have been saying that the fragmentation of so many critical services represents a major risk that one hand doesn't know what the other is doing and that important matters fall down the cracks in between all the different parties. At the urging of Cllr Cooke the meeting then moved onto the meat of the report. The auditors expressed concerns about how certain items were expressed and concerns about the adequacy and complexity of the IT systems including the billing of CIL payments at the right time and how reports are produced. There was some debate as to whether these were old problems or had occurred since Capita took over the finance and IT functions. Despite suggestions by Capita that these were long standing, the Director of Resources confirmed that CIL billing is the responsibility of Re (the Capita JV) and the accounting system was changed when Capita took over the contract in 2013. Yes, Barnet had paid a fortune for a sophisticated SAP system which upon appointment was duly dumped by Capita in favour of their own Integra system which seems to be at the root of a number of the issues that have arisen. Next the discussion turned to pensions. An independent actuary is used to assess both the liabilities and the assets of the pension fund to give a net position. In terms of the liabilities these were adequately calculated but in terms of the assets the actuary was not given the details of the investment portfolio in time and therefore had to make assumptions which turned out to be incorrect and there will material changes to the net pension position. Capita are responsible for preparation of the pension fund accounts. Next up was the issues of exit packages, the payoffs to officers, whereby exit packages should be disclosed when they are agreed not when they are paid. Does this mean that a number of exit packages are still to be disclosed having been agreed before year end but paid after year end? They then moved on to the issue of budget and the fact that the council continue to overspend, this year drawing £18.5 million from reserves and general fund to meet the shortfall. "You are overspending" said the auditor. Perhaps the Tory strategy of multiple years of council tax freeze is now coming back to haunt them and residents. Next was the the issue of contract monitoring. Given how heavily the council rely on outsourced services the auditor was surprised that a number of matters on contract management had been picked up by internal audit when they should have been picked up in the first instance by contract management. This is something I have raised repeatedly with councillors. Let's hope they will now listen to the auditor saying it as well. The net outcome is there will now be an additional audit meeting on the 19th of September to go over the final audit report and to pick up all the outstanding points of which there are many. 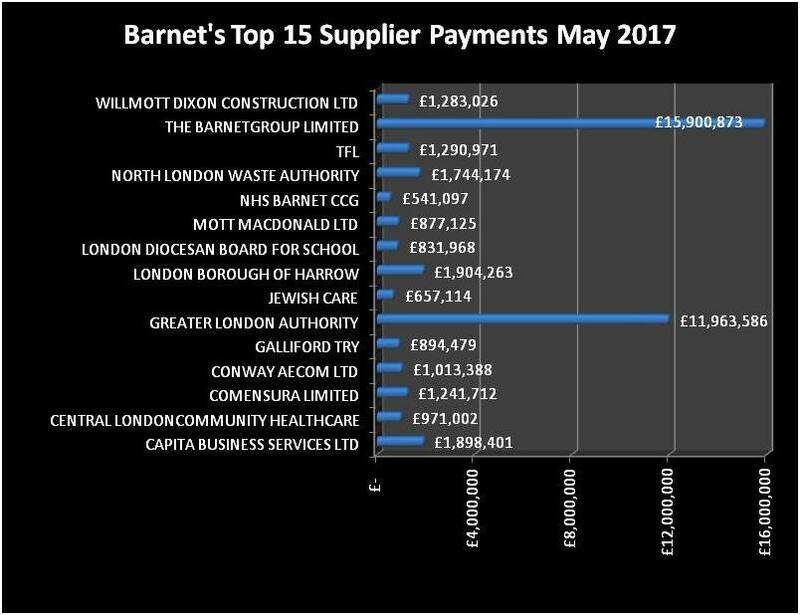 This was a night of shame for Barnet; failure to meet government deadlines, numerous errors and omissions, failure of communications between officers, Capita and the auditors, over complex and inadequate IT systems, problems with contract monitoring and unsustainable overspending. I suspect that if more members of the public were aware of all these shortcoming they would maybe take a different perspective on how well the council is run. It is a mess and outsourcing of critical functions such as finance and IT seems to be at the heart of it. I am sure that Mrs Angry who was also in attendance will give a far more accurate and readable appraisal of the meeting and I urge you to read her blog as well. “There are widespread and serious failures in the services provided to children and their families in Barnet. Inspectors identified a legacy of widespread poor practice and ongoing systemic failures and services that neither adequately ensure the safety, nor promote the welfare of children and young people”. Over nearly a decade of scrutiny by Barnet bloggers, we have investigated and reported the seemingly endless sequence of scandals, blunders, and political folly created by Barnet’s Conservative councillors. The incomprehensible tale of the MetPro fiasco, the disgraceful confiscation of travel passes for disabled residents, the cutting of vital respite care for children at Mapledown School, which cares for children with profound disabilities, the illegal CPZ parking charges, are only some of the many examples of administrative incompetence – and worse – that we have pursued. In any circumstances where there has been proven wrongdoing, or a failure in standards, it is usually the case, in Barnet, that officers are held responsible, and those elected members tasked with the responsibility – and paid generous allowances for those duties –of overseeing the enforcement of their own policies remain distanced from the consequences of their actions. We believe that this is wrong, and that Councillors should be held accountable. That there must be a full open, transparent, and independent public inquiry into what went wrong. This inquiry must include a forensic audit of all correspondence between the Conservative administration and officers, regarding Children’s Services, to ensure that political interference has not, and cannot in future, prejudice the standard of care. This inquiry should be concluded prior to May 2018, to allow the people of Barnet to pass their own judgement on the administration. We call for the resignation of the Councillor in charge of Children’s Services, Cllr Reuben Thompstone. Yet again Capita have received a large payment (£1.9 million) in spite of receiving an advance payment in December 2016 of £26.9 million. The interim and agency staff contract with Comensura was lower this month but still hit £1.24 million. Time will tell whether Barnet really can get this down to a more realistic level. I am currently going through all of the Capita and Re invoices for 2016-17 and will report back when I have a more detailed analysis.